Cindi McRee has worked many hurricanes since she joined Duke Energy in 1999, but this season was unlike any other. Hurricane Florence flooded the Carolinas in September, and weeks later Hurricane Michael wrecked the Florida Panhandle. 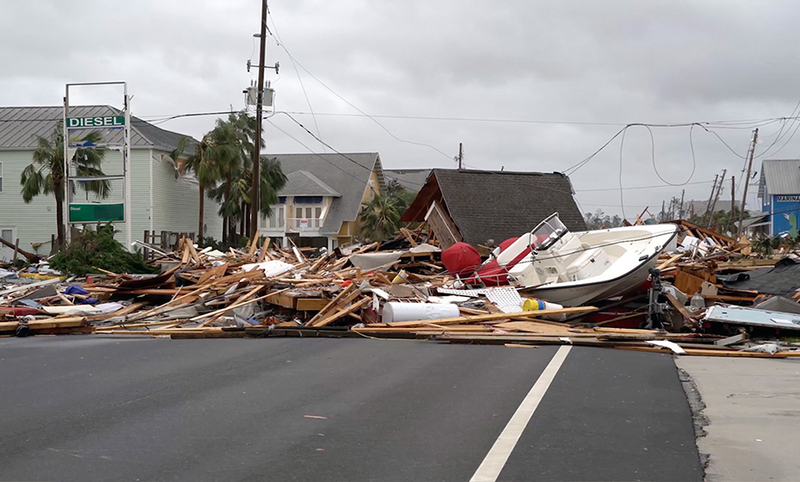 Debris from Hurricane Michael blocked roads and made it difficult for crews restoring power to access the hardest-hit areas. Flooding and debris made it difficult for crews to reach some of the hardest-hit areas, including McRee, who helps organize base camps in strategic locations that provide housing and food for thousands of workers. During Hurricane Michael in Florida, she said, many roads were blocked because of trees that fell. 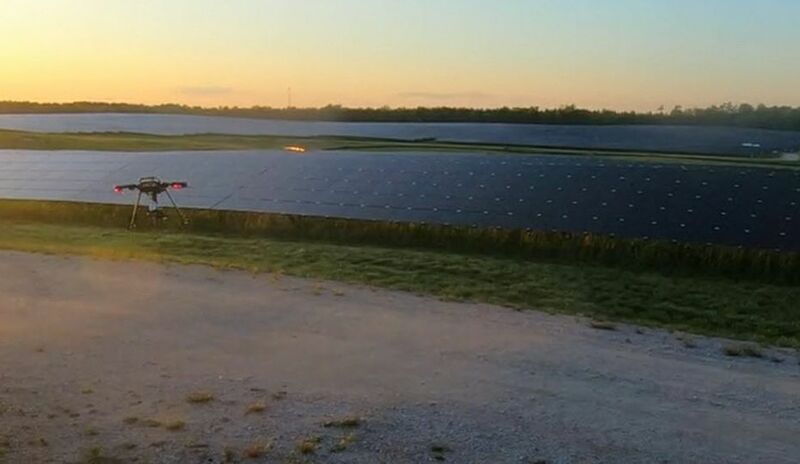 This year, though, Duke Energy had enhanced tools to help. After hurricanes Hermine and Matthew in 2016 and Irma in 2017, Duke Energy developed a way to use GIS (geographic information system) technology to monitor changing road conditions to help crews reach their locations safely and quickly and understand how flooding was affecting customers and equipment. This is a screenshot of one of the GIS applications showing customer power outages (black) in flood zones (yellow) during Hurricane Florence. GIS makes it possible to combine data sets in a map view for analysis and decision making. 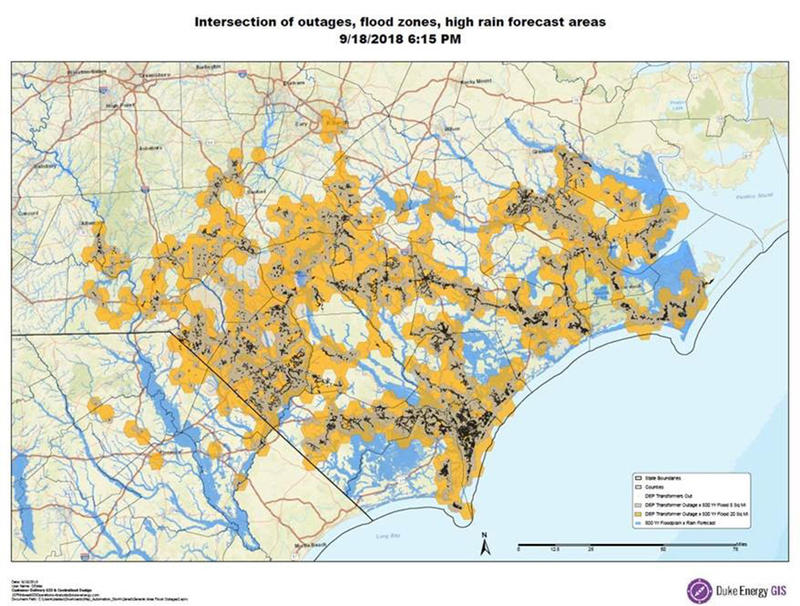 For example, in Hurricane Florence, as road conditions changed rapidly with flooding, a situational awareness team combined weather data and historic flooding levels from NOAA, road locations and conditions from North Carolina and South Carolina departments of transportation, and Duke Energy’s equipment and outage locations. With that information in an interactive database, they could provide the most current information to crews about which routes were likely to be open and which customers were in flooded, inaccessible areas. When traveling crews, especially those from out of state, called the storm center, a data analyst would use the GIS system to help them find open routes. It was a more reliable option than using their phones or GPS, which didn’t always have the most current information. Andy Ortiz was one of the analysts working in the storm center helping crews navigate. It was his first hurricane season with the company, but he said it was exciting to find a new way to assist in restoration. 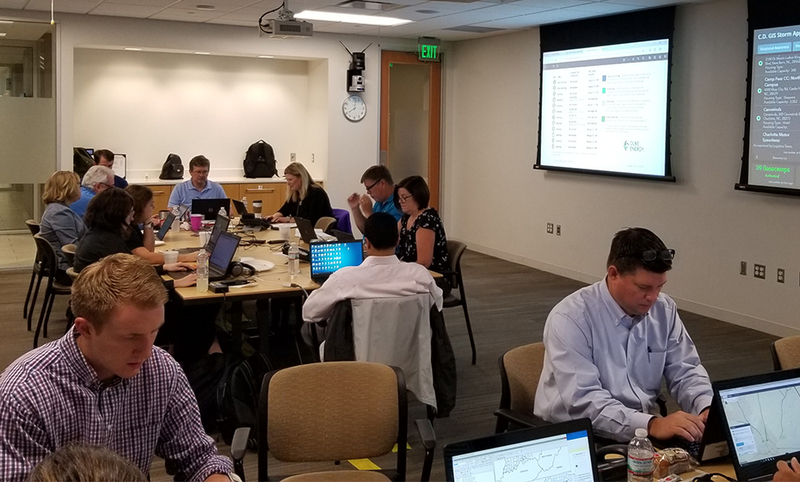 The situational awareness team in the storm center used GIS technology to help crews navigate road closures and solve emergent challenges during the restoration process. 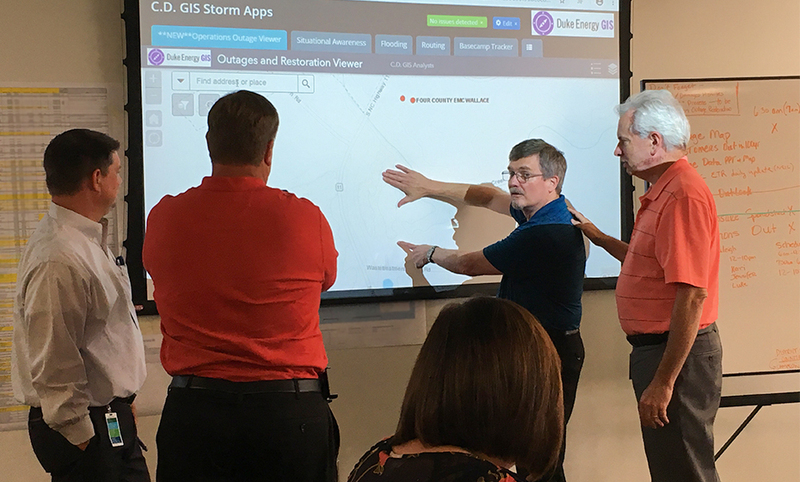 Before the storms hit, the analyst team, led by Kari Hicks and Kerri Kirvin, worked with regional planning directors to anticipate what their needs would be. The team worked through the year to develop applications that would be ready to go for storm season. They layered their data sets on mapping applications so responders could easily see flooded areas, pockets of outages and broken equipment. It helped the directors decide what resources they needed and where. If they could see an area would be inaccessible for an extended period, they knew to send crews somewhere else until the flooding receded. The team was also on standby to find solutions to emergent challenges during the storm, such as identifying customers that were likely to be out of power based on historic flood data or where to place a portable substation to provide power to customers served by one that was flooded. 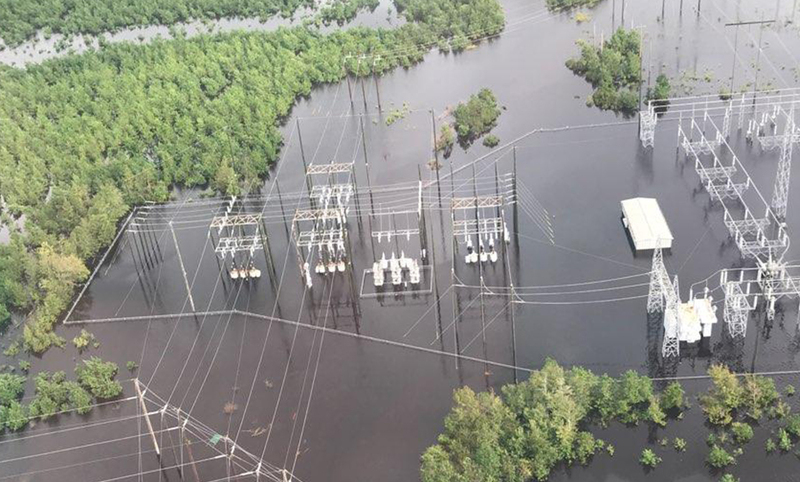 A flooded substation in North Carolina following Hurricane Florence. “Every storm is unique and brings along some unique challenges or ad hoc requests, but we’re getting really good at knowing the kind of things we need to see,” Sharon King, who led the situational awareness team, said. 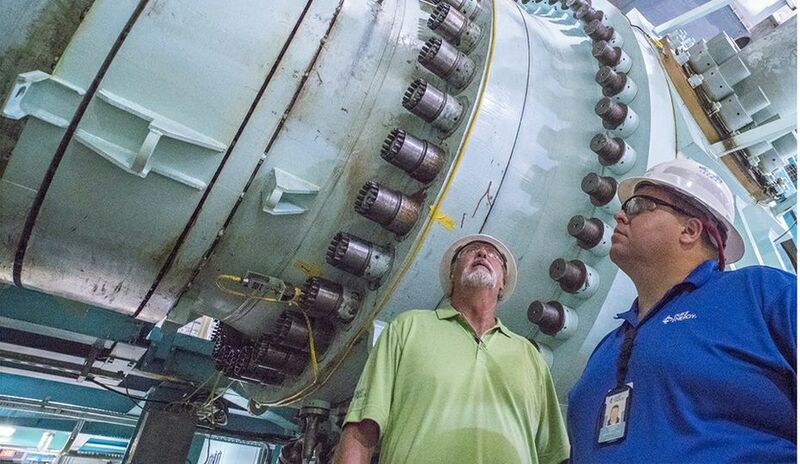 King has seen the technology mature since she started working with GIS at Duke Energy in 1983. At that time, she was manually entering the coordinates of new roads and Duke Energy equipment like substations, wires and transformers. After the data was entered, she would order a map to be printed, and it would arrive two weeks later. GIS analysts and technicians in the Hurricane Florence storm center. Today, the feedback is practically instant. 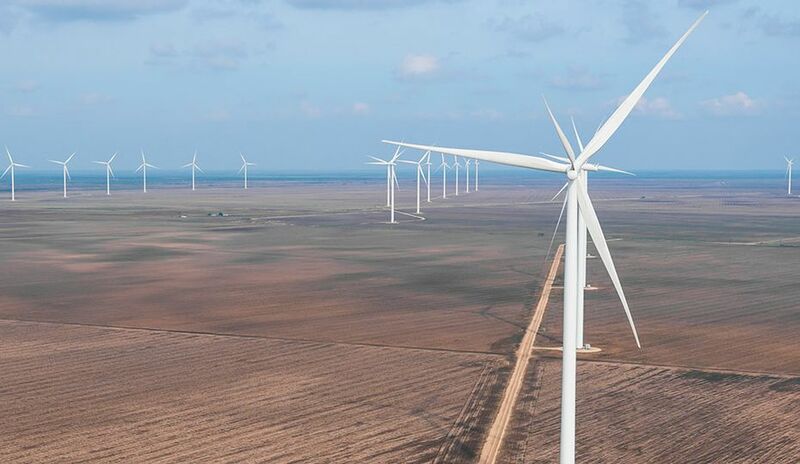 Duke Energy data entered into the system by GIS technicians creates a foundation that can be combined with data from external organizations, like NOAA or DOT, which makes the applications more valuable for analysts and the company during storms and in day-to-day operations. King uses GIS daily to help identify overhead power lines that would be good candidates for burying, and Ortiz works on several projects, most recently, one to help streamline asset reporting for taxes. 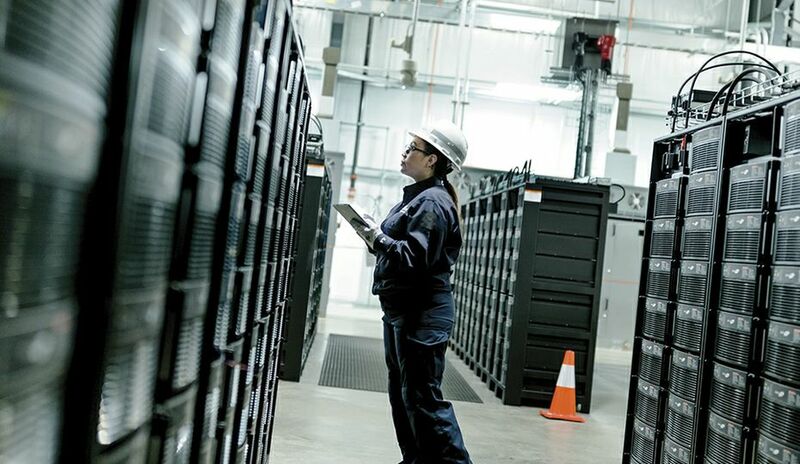 There are dozens of employees across Duke Energy who work on anything from field inspections to power quality and grid maintenance to identifying ideal locations for new electric vehicle charging stations.